The landlocked nation of Laos in South East Asia is often overlooked by visitors to the region, but it’s full of surprising places, friendly people and great food! 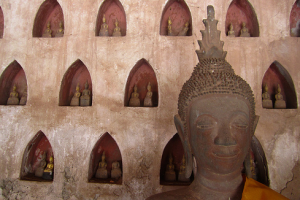 Start here with my basic Laos travel tips, or jump down below to read my latest Laos travel blogs. Laos’ annual climate is roughly divided into two seasons: dry and wet. The dry season is from October to April when temperatures are much higher, and humidity lower, and the wet season runs from May to September, with lower temperatures, higher humidity and chances of flooding. The dry season is typically more popular with visitors, but this means that prices are often higher: by travelling during the wet season, you’ll likely find good deals, especially on accommodation. Kuang Si Waterfalls – A nice half day trip from Luang Prabang is to this large series of cascading waterfalls in the jungle. Since the country doesn’t have any beaches (it’s landlocked! ), these gorgeous turquoise falls and swimming holes certainly make up for it, and the setting is beautiful. Plain of Jars – Likely used for burial rituals, this series of ancient stone jars dotting the landscape in around Phonsavan in central Laos are quite a fascinating sight to behold. Not much is known about their origins, or the indigenous people who created them, but you can easily spend a day exploring the sites where they are found and admiring the green, hilly scenery surrounding you. Vieng Xai Caves – Fancy cycling through a network of connected caves? Well, this is the place to do it! Rent a bike in this northeastern Lao town and take one of the guided tours through the system on two wheels where you can see remnants of the settlements made in the caves as refuge from the bombings in 1960s. 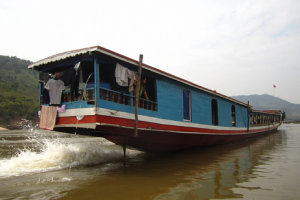 Taking a tour, especially by boat, through Laos can be a great experience, and having it organised for you will save you time and potentially money. The likelihood of experiencing some parts of this fascinating country that you might otherwise overlook is a good reason to take a tour too! 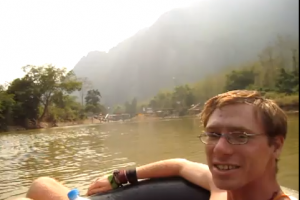 Take a look at this selection of Laos tours. Given that Laos’ population is mostly rural, the majority of the little gay life that exists in the country is concentrated in the capital, Vientiane, though this is somewhat few and far between. Compared to neighboring Thailand, the attitude towards homosexuality in Laos may seem quite conservative, but generally Lao culture is quite open to it and travelling there as a gay person is quite easy. It should be noted that public displays of affection are frowned upon in Laos, regardless of the genders of the people involved. Laos has a great range of accommodation options, from basic budget bungalows to high end hotels and everything in between. I’ve always found that using Booking.com, Agoda.com or Hotels Combined is a great place to start and can be really useful for finding some amazing last-minute deals.